« for a 15 year old. 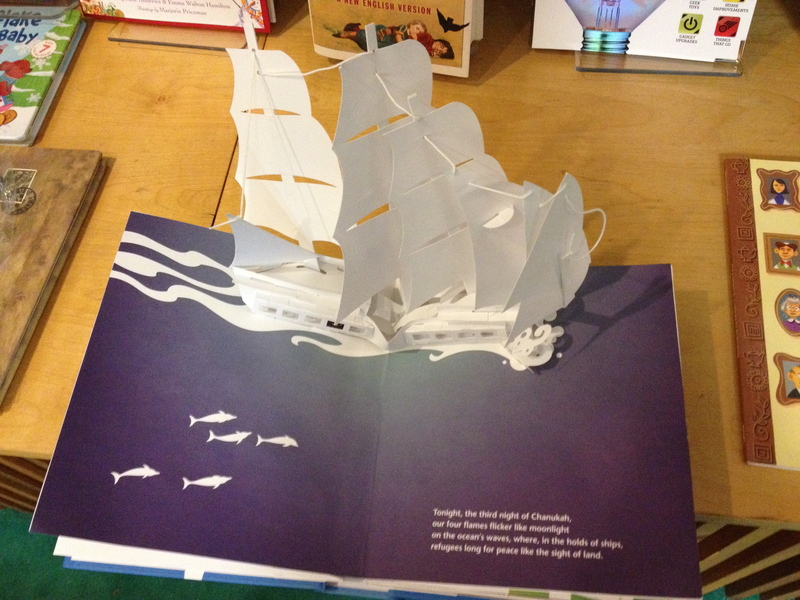 a pop-up book about Chanukah. There are two. Or at least two that I know of. One for young children and one for older children and adults. Chanukah Bugs by David Carter (Little Simon, $10.95) is part of Carter’s bug series, that includes School Bugs, Beach Bugs, Birthday Bugs, etc. It’s a whimsical book filled with animated, holiday-themed creations, such as the Shammash Bug, the Dizzy Dreidel Bug, and the Menorah Bug. The vibrant pictures will appeal to young children (2-4), and older kids (4-7) will appreciate the complexity of the art. refugees long for peace like the sight of land. The illustrations, from the ship of the third night to the city in the eighth night, are truly remarkable. Deceptively simple — using only white paper — the shadows and intricate shapes of the art are inordinately complex and can be looked at and studied for hours. This book is a treasure that should be shared with children old enough to value its delicacy.